EPIC have released v32.2 and with it, a whole host of Halloween themed skins. I love Halloween. It's a shame I live in the United Kingdom because were I to be in America, I'd likely be dressed up asking for candy, despite being thirty years of age. What's also fantastic about Halloween is the fact many game developers choose to adopt the theme and Paragon is no exception. EPIC have gone way out on the 7 skins available, with a variety of Heroes getting the spooky treatment. Khaimera in particular looks incredible (that's the clown). Take a look at the video below, patch notes as well as the blog post. As the stars descend the Agoran sky and their power takes its leave, spirits gather beyond the veil and wait for Shadow's Eve. It’s time to gather for mischief and mayhem during this year’s Shadow’s Eve! Sport spooky new skins and show off your shadowy spirit from October 11 - November 6. To win, link your Twitch account, then watch or stream Paragon from October 11 - 24 for a chance to get a free Shadow’s Eve skin drop. During the entire event, play as Dock-o-Lantern Murdock for free. Those who have linked their Twitch account can permanently unlock the skin. Six Shadow’s Eve skins will go on sale from October 25 - November 6, with a specially discounted bundle available as well. Over the next two weeks (October 11-24) everyone who has linked their Twitch account will have a chance to win up to six Shadow’s Eve skins on Twitch by watching or streaming Paragon. The skins that are being dropped will vary each week, so check out the full breakdown below. Shadow’s Eve arrives with a special treat, Dock-o-Lantern Murdock is available for all players to equip for free during this event. 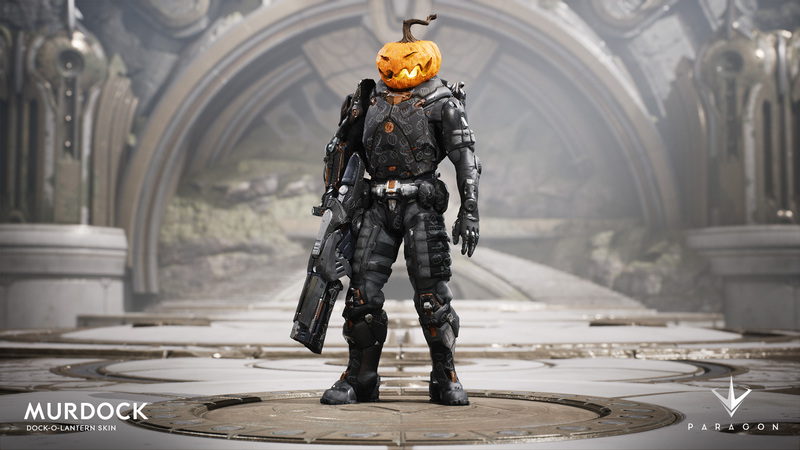 Players who have linked their Twitch account by November 6 can permanently unlock this skin on their account to keep blasting enemies as a pumpkin head all year long! All six of the main Shadow’s Eve skins (Sweet Dreams Khaimera, Feline Queen Sparrow, Mephisto Gideon, Skull-Bot Twinblast, Spider Witch Belica, Franken-Grux) will be on for sale for a limited time only (October 25 to November 6), with a discounted bundle of all six also available. We’ll also be introducing dynamic bundles with this sale, which let you keep the bundle’s discount and only pay for the bundle content you don’t already own. Example: You already won two skins from the Twitch drop. You can get a bundle for the remaining four skins at the discounted price, without paying extra for skins you already own. GLHF and Happy Shadow’s Eve! Welcome to our V.32.2 Release, we have a new weekly card pack with some awesome cards, as well as some bug fixes. Our Shadow’s Eve event begins tomorrow (October 11) with the release of V.32.2. Check out all of the details including how to unlock Dock-O-Lantern Murdock permanently and more in our spooky blog. The siege minions should now correctly spawn in Super Minion waves as intended. This should help provide for more consistent pushing power from Super Minion waves spawned after killing an inhibitor. In our card pack for this week, we have some awesome cards to help you out in multiple scenarios. We start off with Fountain Spike, which provides you with mana, in addition to some damage. It can be useful if you plan to play in a lane as Kwang or Feng Mao. Then we haveGuardian’s Key, which can be very useful for jungle sustain, providing you with health and damage to take those camps out. The weekly pack rounds out with Dreadfeast Relic, which gives you and your teammates lifesteal. Use it to grant sustain to yourself and allies in a teamfight. Dock-O-Lantern Murdock available for all during the Shadow’s Eve event. Make sure to link your Twitch account to unlock it permanently. Siege Minions should now spawn correctly in Super Minion waves. Fixed errant bot pathing around inhibitors. Note: Tainted Magick will be disabled in this release due to a bug. This week we will not have a community pick in this pack, but it will be included as soon as the issue is resolved.